Our offices were voted Best of the Best Podiatrists by the readers of the Home News Tribune and the Courier News. 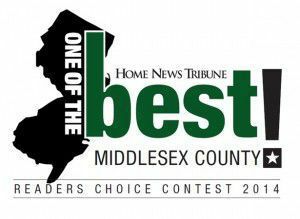 Each year the paper holds a vote, asking reader to pick the very best businesses in their communities. Everything from best pizzeria to best preschool is listed and readers are asked to fill in who they think is really the best of the best. Family Foot & Ankle Specialists has been voted Best of the Best again! "We want to say a huge thank you to everyone who voted us Best of the Best," stated Dr. Wishnie, owner of Family Foot & Ankle Specialists, "we really do have the best patients and we're so lucky to be able to make them feel better everyday!" Dr. Peter Wishnie opened Family Foot & Ankle Specialists over 24 years ago in Piscataway, NJ. Then as the practice grew, Dr. Wishnie decided to open a practice in Hillsborough, NJ over 8 years ago. Unlike many other offices around, Family Foot & Ankle Specialists prides itself on having the best team around. The doctors are skilled, experienced and caring and the staff is as friendly as they come. You are always greeted with a smile by this team and going above and beyond to make their patients happy and comfortable is the norm in the office. "Consider Yourself One of the Family" is their motto, and they really live up to it! In addition to a team you will love, the office has the most state of the art equipment in order to handle all of your foot and ankle needs. Digital X-Rays, cryotherapy, laser therapy, on-staff pedorthitsts are just the beginning. Family Foot & Ankle Specialists stays educated on the latest treatment methods in order to ensure their patients get the best, most effective treatment plans. If you are experiencing foot or ankle pain and want to learn how the Best of the Best podiatry office can help you, call their office to set up a free exam! Piscataway (732) 968-3833 and Hillsborough (908) 874-8030, or click here to set up an appointment online!